What can geothermal streams in Iceland tell us about the effects of global warming on aquatic ecosystems? 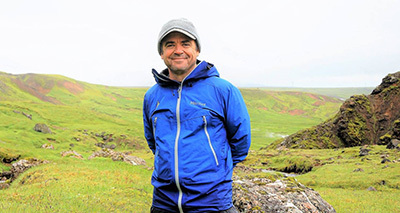 OU ecologist Scott Tiegs is part of a research team that traveled to the Nordic island nation to find out. In collaboration with researchers from Imperial College of London and the University of Essex, Tiegs performed field work in Iceland’s Hengill region, located about 30 miles northeast of the capital city of Reykjavik. As Tiegs explained, many of the streams and rivers in the region are under geothermal influence, resulting in a broad range of water temperatures. The environmental conditions allow researchers to test ideas about how ecosystems will function in a warming world, especially as it relates to carbon cycling. The carbon cycle performs life-sustaining functions, including regulating the earth’s climate. But as global temperatures continue to rise, alterations to carbon cycling could fuel global warming even more, researchers warn. “Aspects of carbon cycling, such as organic matter decomposition rates, are highly sensitive to warming,” said Tiegs, an associate professor in Oakland’s Department of Biological Sciences. “In a warming world, there are concerns that a greater proportion of the organic matter stored in our ecosystems will be converted to CO2, further contributing to climate change. We used the geothermal streams in Iceland to quantify relationships between temperature and rates of carbon cycling." Tiegs also noted that previous work in the streams found that the communities of microbes and insects differ greatly due to temperature. The team wanted to find out if these changes in community structure affect how the ecosystem functions. Having returned from the field, they will process the samples they collected in order to better understand how aquatic ecosystems will function in the face of rising temperatures around the globe.